Many brides and grooms like to exchange gifts prior to their wedding ceremony. Although it’s usually a private occasion when the bride and groom can take some time for themselves before the wedding, the couple’s photographer is often present to capture the moment. Thanks to bride Shayne and the couple’s fabulous photographer Veronica Lola Photography, we get a little glimpse into that moment when Shayne surprised her husband-to-be with a personal and unique groom gift just before their wedding. 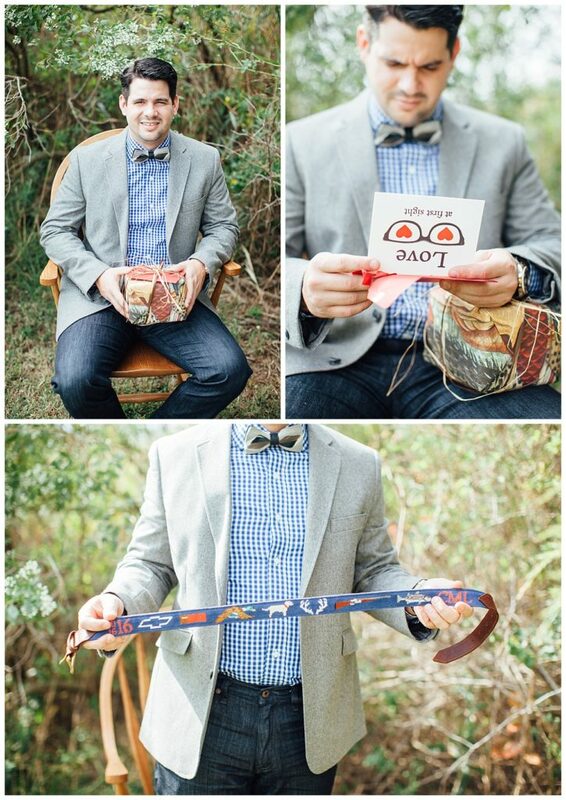 This groom’s gift – a custom, needlepoint belt from Brewster Belt Company – features images of some of the groom’s favorite things, as well as the wedding date and a monogram of his initials. The groom isn’t the only member of the wedding party who would appreciate a custom, hand-made gift. 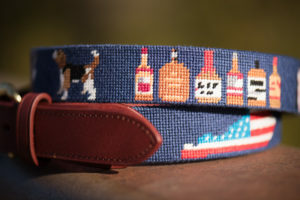 If you’re racking your brain for unique and personal groomsmen gifts, custom needlepoint flasks, belts and wallets make great gifts for groomsmen and family members. 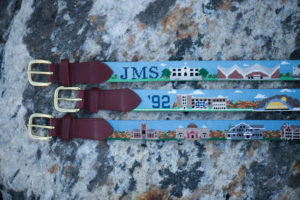 Brewster Belt Company will work with you to create the perfect design and each item can be personalized with a monogram as well. 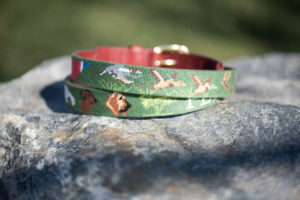 There is also a 20% discount when you order five or more custom, needlepoint items. And, don’t forget the bride! 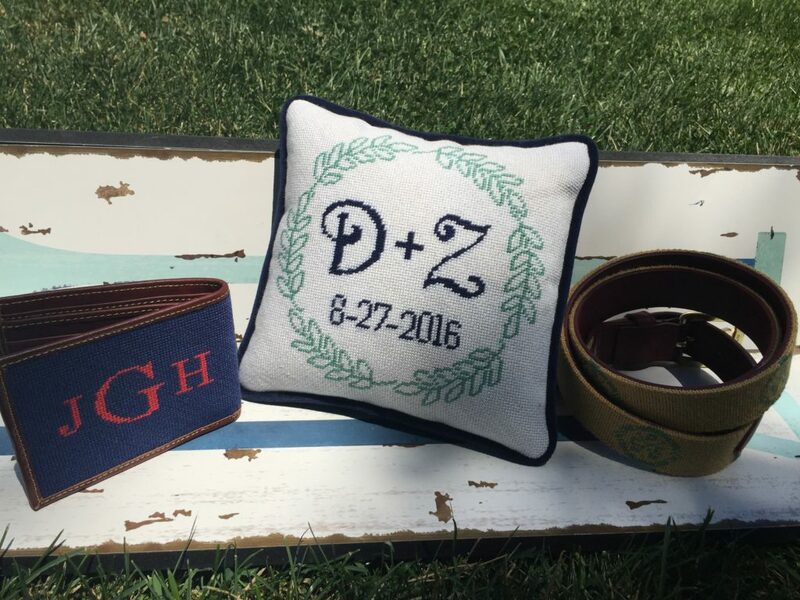 For the bride, Brewster Belt Company can design and stitch a custom needlepoint ring bearer pillow in your wedding colors. Pillows can include graphics, your wedding date, monograms and more. Custom, needlepoint groom, groomsman and bride gifts are personal, thoughtful and can serve as a cherished memory for years to come. 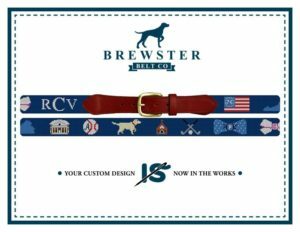 To place your custom order visit BrewsterBelt.com or contact us to discuss your design ideas. According to wedding tradition, the groom typically gives his bride-to-be a gift the day before or day of the wedding. Today, many grooms still carry on this tradition and a growing number of brides have started surprising their husbands-to-be with sentimental, pre-wedding gifts…But, it can be hard to find a gift that is meaningful, personal and practical. 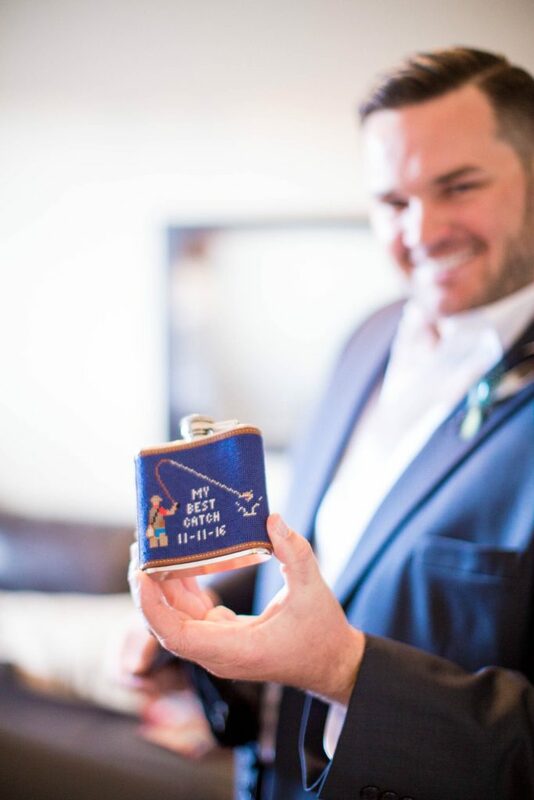 Lynsay, a bride in Virginia, worked with Brewster Belt Company to create this adorable (uhem, manly) personalized wedding gift for her “best catch.” The custom, hand-stitched needlepoint fly fishing flask was well-received by her groom, but she’s not fishing for any complements (ba-dum-dum). 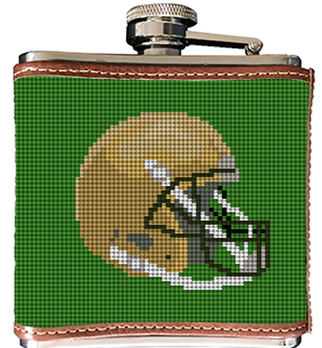 If you’re racking your brain for unique and personal groomsmen gifts, custom needlepoint flasks, belts and wallets make great gifts for groomsmen and family members. 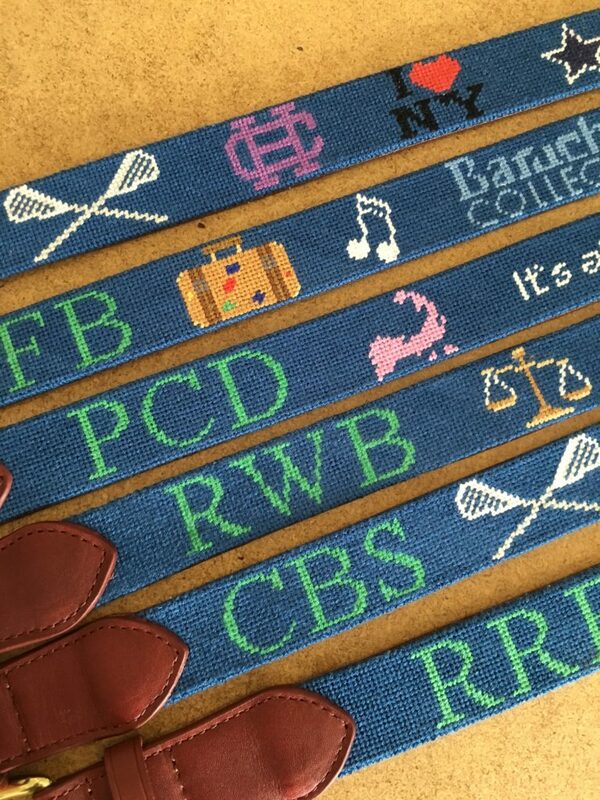 Brewster Belt Company will work with you to create the perfect design and each item can be personalized with a monogram as well. 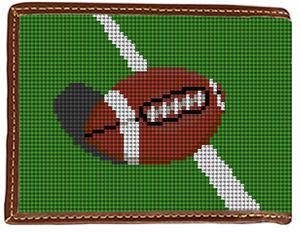 There is also a 20% discount when you order five or more custom, needlepoint items. For the bride, Brewster Belt Company’s sister company, NeedlePaint can design and hand-stitch a custom needlepoint ring bearer pillow in your wedding colors. Pillows can include graphics, your wedding date, monograms and more. 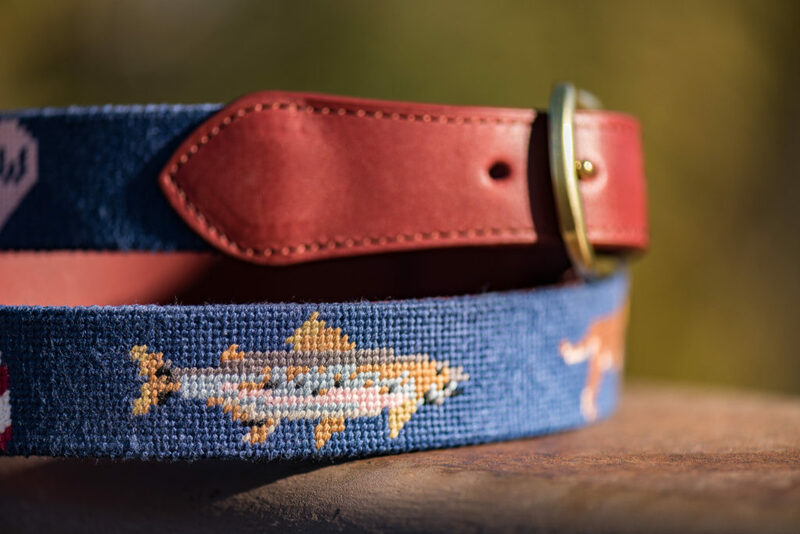 Custom, needlepoint groom, groomsman and bride gifts are personal, thoughtful and can serve as a cherished memory of the wedding for years to come.